Tout quarry is situated on the Isle of Portland in Dorset. Portland limestone is a very well-known building material and has been used in the construction of many iconic structures, including St Paul's Cathedral, the Tower of London and the British Museum in London and the UN building in New York. Since 1983, the year after quarrying at Tout ended, stone carvers have made carvings there and many of them can be seen by visitors. The quarry is accessible for free at any time, so some of the early works have been vandalised or damaged, but there are over 70 that can be found by looking carefully around the network of quarry paths. The quarry is now officially closed to new carvings being added to the rocks and is a nature reserve. Stone carving lessons are taught in a corner that has been set aside for tuition. We were lucky to visit on a beautiful sunny spring day and got some nice photos of some of the work at Tout. If you would like to visit the site, be aware that you will need some stout footwear as the ground is pretty uneven and also watch out for steep drops and falling rocks. I wish that it was possible to tell you who did every piece, but by the time we passed the information board above I was pretty lost myself! This is probably the most famous sculpture at Tout. It was carved by the well-known sculptor Antony Gormley and is called 'Still Falling'. ...and 'Window' by Justin Nicol, which really comes alive when the evening sun hits it. Here are a few others that are hidden about the quarry. Many have been carved in secret, so the noticeboards won't tell you who made them. A group of Dutch carvers called Groupe 85 come over every year and have special permission to work on some large sculptures in one corner of the quarry. This large sculpture of an octopus or kraken had traces of the crayon used to mark out the design still on it, so has been worked on fairly recently. I hope that you have enjoyed this post, showing just a few of the many sculptures to be found whilst searching around Tout quarry. The chisels are designed to be mainly used with a small mallet (not shown, but similar to the one on the photo below) and are made from good-quality tool steel, without a wooden handle. 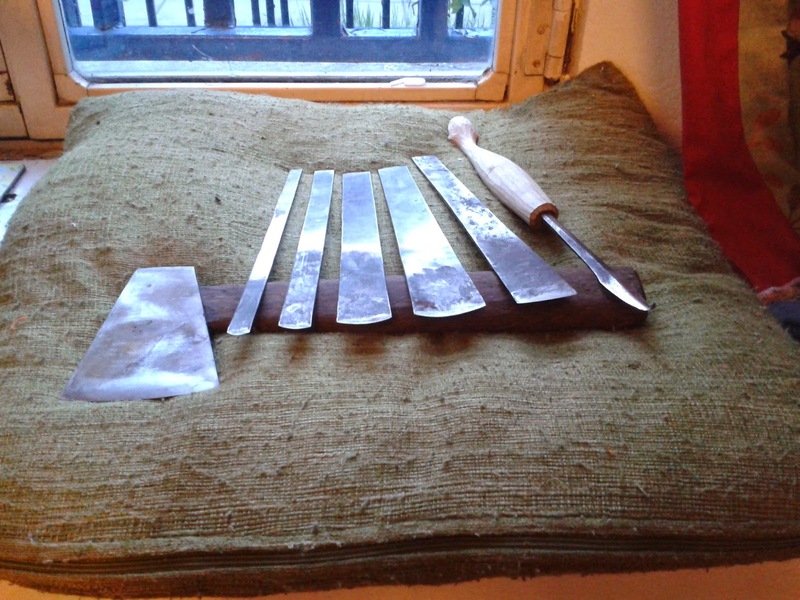 The one on the right of the all-metal tools shown in the pictures is a flat chisel, the others have a slight sweep (curved cutting surface). They are tempered at the cutting end, so the edge is very sharp but the untempered steel behind it would give a bit of cushioning of blows and strength to the rest of the tool in use. 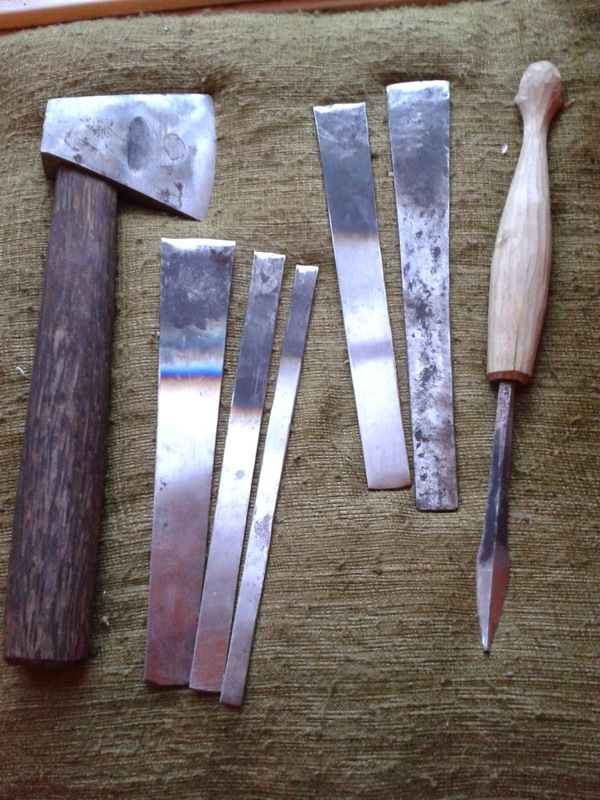 The gracefully shaped tool shown on the far right is very comfortable when held in the hand and is possibly the most unfamiliar-looking to a European carver. It functions a bit like a hook knife (or crooked knife). The blade is spear-shaped, with the point curled upwards. It also has a flat surface on one side and two cutting edges on the other, so that it can cut in either direction. This would be used to give a fine finish to the surface of a carving. The axe is razor-sharp and feels great in use too. The haft (handle) looks as if it is made from Black Palm (also known as Black Palmyra) timber. This palm is commonly used throughout tropical Africa and Asia for a variety of purposes and the timber from the outer part of the main stem is dense and hard, becoming softer towards the centre. In this way, the palm is different from many other timbers that become denser towards the centre of the trunk. 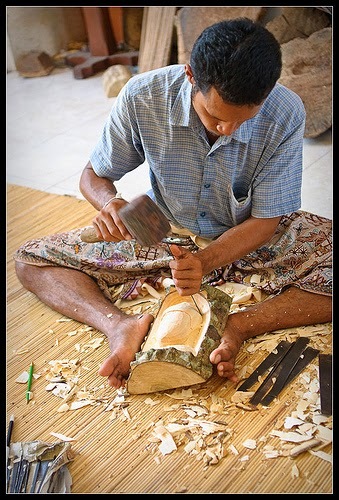 As you can see from this photo, Balinese carvers tend to work sitting down and sometimes hold the wood being worked on between their feet. 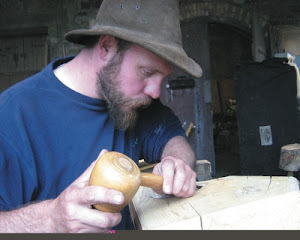 It's a method used all over the world but is quite different to the traditional European method, which involves standing at a bench or carving stand to work. I suppose that sitting on the floor wouldn't have been so appealing to medieval carvers in a cold, wet Northern European winter! Today, I went over to 'The Limes', a day centre for people with Alzheimer's in Bristol, to carve an inscription on a bench designed and made by Sue Darlison. Sue is a very talented local designer maker as well as the curator of the 'Inspired' exhibitions, which have previously included some well-known exhibitors such as John Makepeace and David Colwell of Trannon furniture. The bench is called 'Bridget's Smile,' as it was inspired by the smile of a lady who used to attend the centre. The seat and backrest are Cedar of Lebanon and the legs and backrest supports are Oak, all of which came from the local area. I used a Dremel hand drill with a rotary burr to cut the letters, as it seemed to give a better effect with this font and also worked on the cedarwood more efficiently than hand tools, even very sharp ones. The cedar gave a lovely smooth and polished finish when the lettering was finished, which can be hard to achieve when working on many other types of softwoods. Sue and I are sure that Bridget would approve.